Lactium is a natural product that offers a simple, readily available and safe solution for coping with emotional and psychological stress, with no need for consulting a physician or prescription drugs. 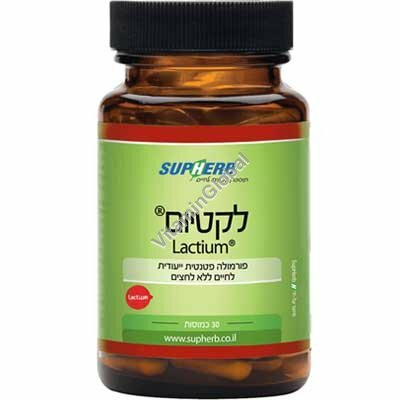 Lactium was isolated from breast milk for the first time during a research study on the calm state of a baby after breastfeeding. This is an ingredient that contains a short-chained protein which is uniquely dissolved in the digestive system of babies, an ability which disappears in adult life. To induce sleep: 1-2 capsules a day with meals. For general relaxation: 1-2 capsules a day with meals. Chronic stress: 1-2 capsules a day with meals. Acute stress: 2 capsules at once with meal. Inter-drug effects: May be used in combination with drugs of the Benzodiazepine and the SNRI/SSRI.